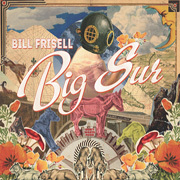 "It's hard to find a more fruitful meditation on American music than in the compositions of guitarist Bill Frisell." Bill has been honored with appointments from two major US jazz institutions: SF JAZZ Center named him Inaugural Artistic Director along with fellow Artistic Directors Regina Carter, Jason Moran, John Santos and Miguel Zenón to oversee programming and performances, and Jazz at Lincoln Center named him Guest Curator for the Roots of Americana series during its '13 - '14 season. Collaborated with artists as diverse as Elvis Costello, Bono, T-Bone Burnett, Paul Simon, McCoy Tyner, Ornette Coleman, Brian Eno, Ry Cooder and many more - a testament to his virtuosity as a guitarist, bandleader and composer. Winner - 2013 DOWNBEAT Critics Poll for Best Guitarist for the 12th time. Also ranked among the Best for Jazz Artist of the Year and Jazz Album of the Year for Enfants Terribles, his collaboration with Gary Peacock, Joey Baron and Lee Konitz. DOWNBEAT Readers Polls - 3-time Best Guitarist winner. Also ranked among the best Jazz Albums of the Year for Beautiful Dreamers and All We Are Saying, and Best Beyond Albums for his collaboration with Vinicius Cantuária, Lagrimas Mexicanas. Guitarist of the Year 2013, 2012, 2009 and 2008 in the Jazz Journalist Association Jazz Awards - also nominated in 2011 and 2010. "It's hard to find a more fruitful meditation on American music than in the compositions of guitarist Bill Frisell. Mixing rock and country with jazz and blues, he's found what connects them: improvisation and a sense of play. Unlike other pastichists, who tend to duck passion, Mr. Frisell plays up the pleasure in the music and also takes on another often-avoided subject, tenderness." "Bill Frisell plays the guitar like Miles Davis played the trumpet: in the hands of such radical thinkers, their instruments simply become different animals. And, like Davis, Frisell loves to have a lot of legroom when he improvises - the space that terrifies others quickens his blood." "Bill Frisell is the Clark Kent of the electric guitar. Soft- spoken and self-effacing in conversation, he apparently breathes in lungfuls of raw fire when he straps on his (guitar)...His music is not what is typically called jazz, though it turns on improvisation; it's not rock'n roll; and it sure ain't that tired dinosaur called fusion. 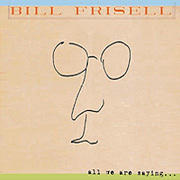 In one of the biggest leaps of imagination since the Yardbirds and Jimi Hendrix, Frisell coaxes and slams his hovering split-toned ax into shapes of things to come...But besides being a guitar genius, he's turned into a terrific songwriter. Like Monk, Frisell's harmonic and melodic ideas form a succinct, seamless mesh with outer sonic and rhythmic ideas about his ax."